The guestbook in Annie Leibovitz's "Pilgrimage" exhibit was easy to miss. But some did stop to write or draw something and she might have seen their entries. 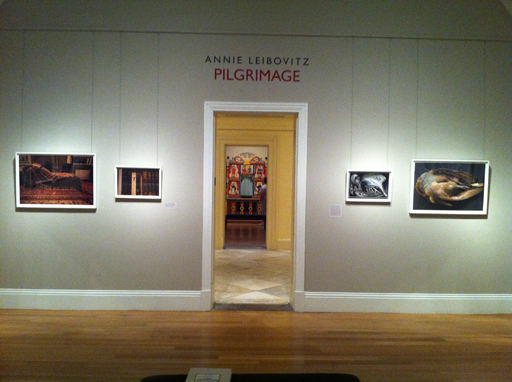 WASHINGTON – The guestbook in Annie Leibovitz’s “Pilgrimage” exhibit was easy to miss. Tucked into a corner of the exhibit’s third and final room in the Smithsonian American Art Museum, it played last fiddle in an orchestra of photography showcasing what inspires Leibovitz as an American artist. But some did stop to write or draw something – and Leibovitz might have seen their entries. Andy Grundberg, associate provost and dean of undergraduate studies at the Corcoran College of Art and Design, curated Leibovitz’s exhibit, which was displayed in D.C. from January to May. It then began traveling to other museums. Grundberg said he went back to the show around a dozen times. After giving a tour, he would gravitate back to the guestbook to read what people were writing. He was curious if the notes were influenced by each other. Leibovitz is a celebrity in her own right as someone who’s photographed celebrities, Grundberg said. He thinks the entries in Leibovitz’s guestbook speak to the degree of intimacy that people feel with well-known celebs.